The thing about French food is that it is not always technique driven. However, it usually takes a long time, whether it’s boeuf bourguignon or croissants, be ready to spend a couple hours before being product ready. The hubs, Hartley and myself went to France three years ago, while I was pregnant with the twins, to visit a dear friend and new adventures. I always knew I loved pastries, but a French pastry is like none other. They are light, flaky and buttery. They crunch when you bite into them and they always leave a trail. How the women of France stay crumb free is unbeknownst to me. Patisseries in France, specifically in Paris, are like coffee shops and Marijuana dispensaries in Colorado, literally on every corner. So obviously there is more than one way to create the croissant. I think as long as you have the basics down of folding dough and butter into many layers, you can make your own version of a croissant and impress your friends and family. 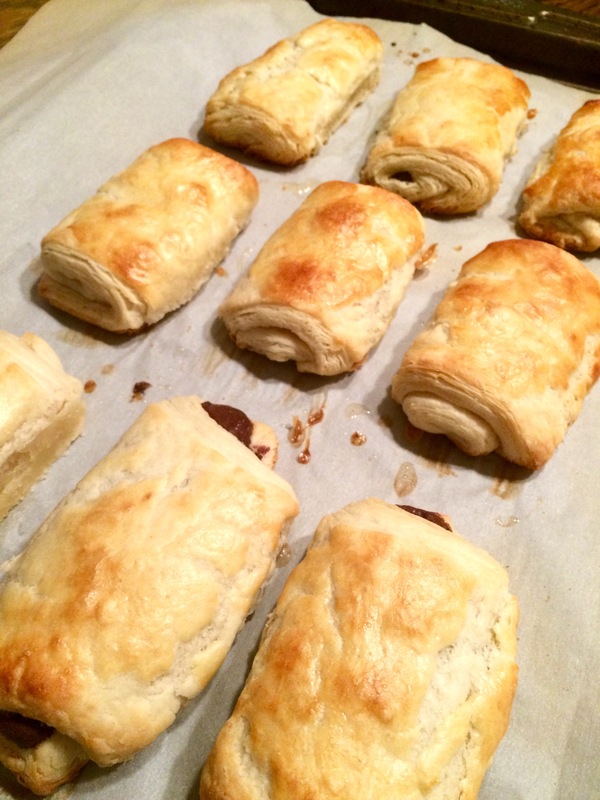 Most recently, while I was also preparing dinner, I asked the hubs to help me make a batch of croissants. It was a learning experience for both of us…mostly him. I say it was a learning experience because at the moment I am temporarily handicapped…torn meniscus and bilateral patella. Sounds fun right? Due to my injury, walking is a chore. So the hubs offered to fill in the extra steps of the recipe since I was saving actual steps across the floor. Ain’t he sweet? So on a flat lined (either parchment or plastic wrap) surface, put your cold butter in the center and beat/roll into a flat disc about 10″ x 12″ and place it in the refrigerator. The dough from the mixture now needs to be rolled out to 12″ x 24″, enough to almost cover the butter disc. Once the dough is rolled out, put your butter disc in the middle and fold it over. 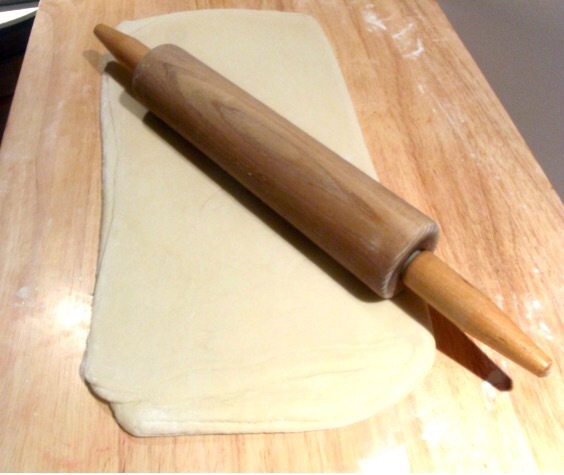 Fold the dough and butter combination into thirds and roll until it is one 1/4″ thick. Repeat this process at least six times, no more than eight. With these steps, we are trying to achieve the layers of dough and butter which give croissants, and really any French pastry, its unique texture, taste and flakiness. Allow the dough to rest for one hour in the refrigerator or in a cool place. Now it is time to decide what you want to do with your croissants. You can make them plain or fill them with a variety of tasty items like chocolate, Nutella, berries, cream cheese or mascarpone, etc. If your dough is rolled out correctly, it should be about 1/4″ thick, reaching 12″ x 24″. Cut the dough into 3″ x 6″ rectangles, yielding roughly 16 croissants. If you choose to fill the croissants, place your filling on the first third of the dough before rolling. Roll the croissant very gently and NEVER push down on them. We want air in these cuties. Place the croissants on a baking sheet lined with parchment paper, leaving 1″ of space between each one. I find it easier to have seam-side down, otherwise your croissant can open up in the oven. In a small bowl, crack your egg and whisk with a tsp of water. Using a pastry brush over the top of croissants, brush the egg wash to help achieve that “golden brown” appearance. Bake for 14-16 minutes at 375 degrees or until golden brown. My family and I cannot resist allowing any time to cool, but we recommend at least 10 minutes of cooling time prior to devouring your creations. Although the hubs learned a lot by helping me with our croissant adventure, he continues to find eating them is his true calling.